Dallas County. We are stacking you with full very best services. and Clean Green, Inc. delivers and stacks the wood for you. For more information, contact us. Lakewood Villages, Paloma, Creek, Prosper, Providence Village, Frisco, McKinney, 380 Corridor, Aubrey, Shady Shores, & North Dallas. Call or Text at 972-998-2076 for delivery and stacked quote! Please fill out as much of the information as you can in the fields bellow and we will get back to you! Split Seasoned Firewood Picked-up Pricing. stacking fee may vary depending on distances. Clean Green, Inc. Firewood's Add some taste to your meals by cooking with Pecan, mesquite or oak woods is combination of our hard wood logs. For all hard mixed woods are the best choice for home owners and restaurants. Find local hard firewood, seasoned or/and fresh cut and dried split oak 16" or 18" firewood. Also custom cut logs. Pick up or Delivery Split Firewood For Sale! Firewood since 2004 We have plenty seasoned firewood. We have premium firewood cut to seze for a variety of useges fireplace, campfire, BBQ, & firepits. We load the firewood in your vehicle for you. All hardwoods (Mix of Oak, Ash, Maple, Elm) Serving in Denton county, Oak Point, Cross Roads, Aubrey, Allen, Prosper, Highland Village, Lake Dallas, Lakewood Village Providence Village, Savannah, Paloma creek, Denton, Little elm, Dallas, Plano, Frisco, Shady shores & the entire Metroplex. We offering and supply at lower price for you! We are always ready to delivery or serve you. When you choosing firewood, you need to know the difference between hard and soft wood. hardwood will burn longer than soft wood. If you need a wood for cooking in summer or winter. 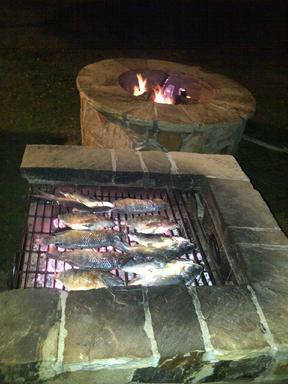 If you want a campfire for winter camping, best hardwood burning include oaks, maple, elm and ash trees. soft wood include cedar, cypress and pine trees. If you like firewood with a nice aroma, oak and cedar firewood. We service customers in north Dallas Texas area with seasoned premium woods and is ready to burn upon delivery or pickup. 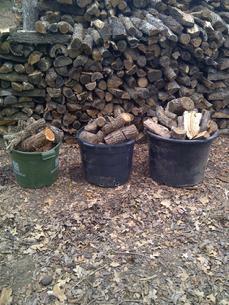 Buying or finding firewood for any burning, we have a lot of seasoned wood ready to burn. This north Dallas Texas fire wood it is also a great wood for those who heat their homes with firewood. Wood burning stoves, fireplace. and/or outdoor firepit or fireplaces. Our wood has been seasoned at least a year and burns hotter and cleaner than fresh cut wood and easier to start. 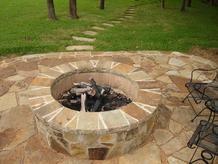 Gas Fire pit to keep your family and friends warm! build by Clean Green, Inc.